Sitting in a director chair gives a sense of power for good reason. The director chair design is a descendant of the French "fauteuil," the field chair of Napoleon I. Even though visions of directors sitting behind movie cameras enter people's minds when they think of these chairs, the chairs are actually compact and comfortable. 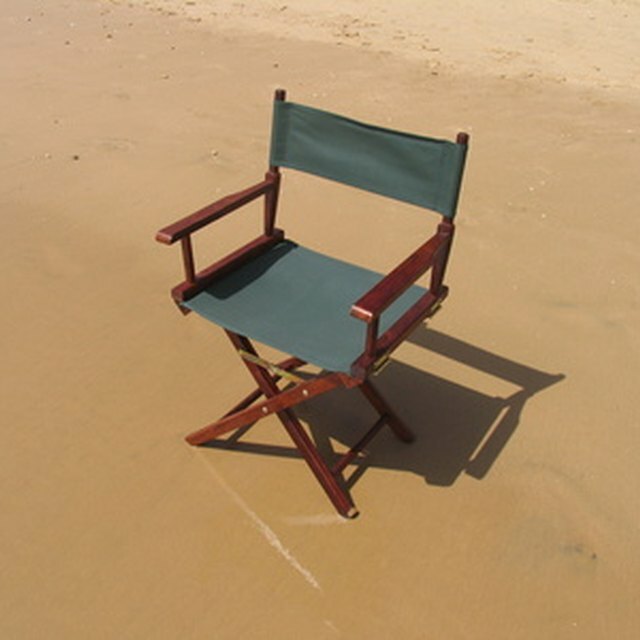 With a little bit of knowledge and some woodworking tools, making your own director chair is easy. Director chairs aren't just for directors. Cut the four legs from the 1-inch thick boards. They should measure 1 inch thick by 2 inches wide by 24 3/4 inches long. Locate the center of the top of each leg and drill a 3/4-inch hole, 1 1/2 inches deep for the 3/4-inch dowel. Measure 5 inches from the bottom of each leg and drill a 3/4-inch hole 1 inch deep for the footrest. Measure 13 inches up from the bottom of each leg and drill a 3/8-inch hole through the leg for the pivot pin. On two of the legs, measure 5 inches from the top and drill a 1/4-inch hole through the leg. These will be the outer two legs. Taper the ends of each leg from 2 inches to 1 3/8 inches. The taper should be 8 inches long. Cut a small bevel on the bottom of each leg and sand all long edges to a rounded shape. Cut out the two seat sides from the 2 inches by 3 inches lumber to measure 2 1/4 inches wide by 1 5/8 inches thick by 14 5/8 inches long. On the bottom of one of the seat sides, measure 3 1/4 inches from the ends and drill a 3/4-inch hole, 1 inch deep for a 3/4-inch dowel. On the bottom of the other seat side, measure 1 3/4 inches from the ends and drill a 3/4-inch hole, 1 inch deep for a 3/4-inch dowel. Cut a bevel along each side seat piece to create a top edge. Cut a notch in each side seat that is 5/16 inches by 3/4 inches. Cut two dowels, one 13 3/4 inches long and one 16 1/4 inches long, for the footrests and cut two dowels 7 inches long each for the armrest supports. Create two armrest bases that measure 1 1/4 inches thick by 1 11/16 inches wide by 15 5/8 inches long out of the 2-inch by 3-inch lumber. Measure 1 5/8 inches from each end on the armrest base and drill a 3/4-inch hole that is 1 inch deep for a 3/4-inch dowel. Sand only the upper edges of the armrest base into a rounded shape. Cut out the two armrests to measure 1 inch thick by 2 1/4 inches wide by 15 inches long. Find the center of the back of each armrest and drill a 3/4-inch hole that is 1 inch deep for a 3/4-inch dowel. Measure 2 1/4 inches from the front edge of the armrest and drill a 1/2 inch deep, 3/4-inch hole on the bottom of the armrest. Cut curves in the front end of the armrests and taper the back end before sanding all of the edges to a rounded shape. Cut out the two back supports to measure 1 inch thick by 1 3/8 inches wide by 15 1/4 inches long. At the center of the bottom of each back support, drill a 3/4-inch hole that is 1 inch deep for a 3/4-inch dowel. Measure 6 7/16 inches from the bottom of each back support and drill a 1/2 inch deep, 3/4-inch hole in the front. Sand all of the long edges to a rounded shape or turn them on a lathe (optional). Cut two 7/16 inch long pieces from the 3/4-inch dowel and drill a 3/8-inch hole through the center of each piece. These will function as the pivot pin spacers. Cut two fabric supports to measure 1/4 inch thick by 5/8 inch wide by 14 1/2 inches long. Make a canvas chair back that measures 7 inches by 21 1/2 inches with 2 1/4-inch sleeves on both ends to slip over the back supports. Create a canvas chair seat to measure 15 inches by 22 inches with 1-inch sleeves on both ends to slip over the fabric supports. Cut two 1 1/2 inch lengths from the 3/4-inch dowels and glue the dowel to each armrest and to each back support in the previously made holes. Cut two 2-inch pieces of dowel and glue each back support to each armrest. Glue each 7-inch armrest support between the armrest and armrest base on each side of the chair. Cut four 2 1/2 inch lengths of dowel and use the dowels to glue the chair legs to the seat sides. Glue the footrests in place, clamp all assemblies tight and allow the glue to dry overnight. On each outer leg, insert the 3/8-inch lag bolts, add a washer and tighten the nuts to "set" the head into the wood. Remove the lag bolts and position the inner legs inside the outer legs. Reinsert the lag bolts, add the spacers between the inner and outer legs, add the washers and then tighten the nuts. Install the locking knife support, with the fold going up, to the inner side of the outer leg with a flat washer between the support and the wood. Install the other end of the locking knife to the outer edge of the inner leg with a flat washer between the wood and the support. The distance between the outer edges of the two armrest bases should be 21 1/4 inches when the chairs is sitting flat. Cut off all bolts including those with the locking nut and file or grind until smooth. Apply a dab of silicone caulk to the locking nut and bolt and allow to dry. Insert the fabric supports into the sleeves of the seat. Measure 2 1/2 inches from the ends of the arm supports and attach the offset hinges. Install the seat by sliding the ends into the notch between the hinge and the armrest base. Secure the armrests to the offset hinges. Slip the back over the back supports to make sure it all fits well. If you desire, remove the fabric, sand and apply wood finish to your chair and allow to dry before putting the fabric back on. Sara Welsh has been writing professionally since 2009. Her areas of interest and writing expertise lie in the arts industry and she has published work for online publications such as Real TV Addict, Digigasms and Robodustrial. She holds a Bachelor of Music in music with elective studies in theater from the Shenandoah Conservatory.